More than half the small businesses that start up are bankrupt after three years, figures show – and the self-employed are the biggest victims. In June 2006, there were more businesses than three years previously – 1963, 907. The creation of businesses in the intervening period still exceeded the number of those that failed. The ABS study shows that survival rate is also linked to age and number of employees. The longer a business survives, the greater its chances of continuing survival. 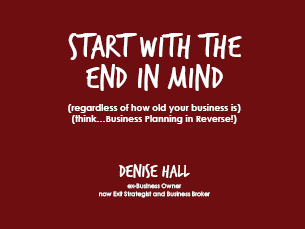 Hence why it is imperative to work on your business, as well as in it (to quote Michael Gerber) so as to ensure you know which way you are steering, and why! A great place to start, and revisit annually. Click here to find out more.